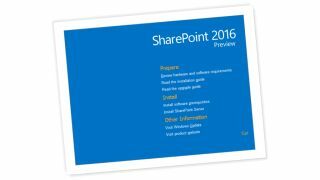 Microsoft is ready to give everyone a first look at its SharePoint Server 2016 IT Preview, which brings a veritable banquet of new features to the table. The new version of Microsoft's document sharing and collaboration tool focuses heavily on mobile and touch devices to make it easier than ever to share. Plus, there is also a new cloud hybrid search that offers a richer search experience than ever before. At the center of the action, when it comes to accessing content on mobile and touch devices, is a deeper integration with HTML5. This allows IT professionals and designers to enable device-specific targeting of content to make the experience uniform for every user. New and improved controls, including an upgraded app launcher that lists all your applications on the top navigation bar, make the user experience a simpler one regardless of whether that involves file creation, sharing or management. Sharing, the biggest element of the whole platform, has also been overhauled with a new 'Share' button in the top right corner of every page. Here, you can enter the names of the people you want to share with and that's it: you've shared it. Nothing else needs be done. Larger files of up to 10GB can also now be uploaded to SharePoint Server 2016. Compliance tools have been improved by a new in-place hold policy and document deletion center that gives administrators greater control over time-based and organization-wide control policies to keep items in SharePoint and OneDrive for Business for a defined period of time. The document deletion center, meanwhile, gives greater control over when documents are deleted. Another new addition to SharePoint Server is a cloud hybrid search that stretches across the 2013 version and Office 365 as well as being built in to SharePoint Server 2016. Combined with Office Graph, the search engine allows users to pore over content across on-premises and Office 365 plus the cloud and results from both will be represented side-by-side. Both the cloud hybrid search and SharePoint Server 2016 IT Preview are available to download right now.